First game in the series developed specifically for PC with full support for VGA graphics and the contemporary sound cards. Characters can be imported from Ultima IV: Quest of the Avatar or Ultima V: Warriors of Destiny (see Import characters). DOS version in DOSBox. 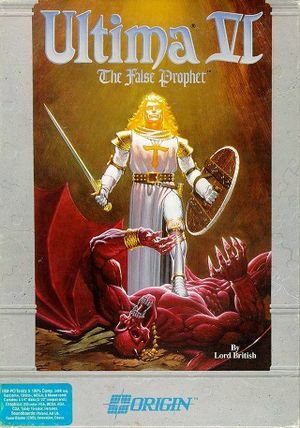 Includes Ultima IV and Ultima V. Pre-packaged with DOSBox. The manual is needed to answer copy protection questions (see manual.pdf for the GOG.com version). Supports importing from Ultima IV: Quest of the Avatar (PARTY.SAV) or Ultima V: Warriors of Destiny (SAVED.GAM). Ultima IV is detected first; move/rename PARTY.SAV to use an Ultima V save if both are present. Go to the Ultima VI installation folder. Make a new folder called ultima (this is not case-sensitive). Copy PARTY.SAV or SAVED.GAM here. Start the game and choose to transfer (or press T). Press C when prompted for a drive letter. Follow the steps to finish importing. 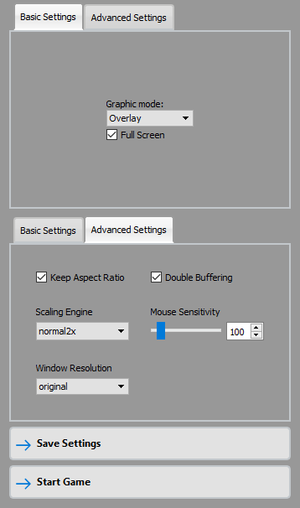 Nuvie is an engine remake that adds new features including higher-resolution support and optional interface improvements. Use the Daily Builds. Use Nuvie (set in Gameplay Options). Nuvie settings are stored in <path-to-game>\nuvie.cfg on Windows, ~/Library/Preferences/Nuvie Preferences on OS X and ~/.nuvierc on Linux. Nuvie saves are stored in a u6_save folder in <path-to-game> on Windows. 320x200. Use Nuvie daily builds for higher resolutions. Toggle with Ctrl+Z. Use Nuvie for separate volume settings. The save can't be overwritten in-game. Run the GOG.com installer again. 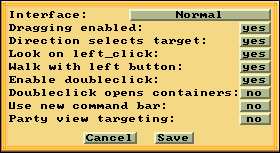 If you have Ultima IV or Ultima V saves you want to keep uncheck those games in the installer options. Continue installation. The save will be replaced. Edit the DOSBox configuration file (dosboxULTIMA6_single.conf for the GOG.com version). Change ULTIMA6.EXE to INSTALL.EXE and save your changes. Press H when prompted for the installation location. 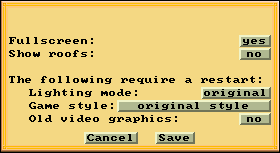 Press 5 when prompted for the graphics mode. Press Y when prompted for mouse support. Press 1 when prompted for a music card. Press ↵ Enter when prompted for a port. Press Y to confirm the settings are correct. Press 1 to clear the current character and exit the installer. Change INSTALL.EXE back to ULTIMA6.EXE and save your changes.